San Francisco Mayor Mark Farrell announced Thursday his plan to include a first of its kind medical team that will treat the cities most vulnerable addicts. In his statement he included a $6 million-dollar budget proposal that included funding for a 10-person street team of specialists with the capability of treating 250 homeless addicts with the addiction treatment drug Buprenorphine, known commonly as Suboxone. Buprenorphine is known by experts as “blindingly effective” at abruptly stopping heroin cravings and is also faster acting with less side effects than Methadone. Locals around San Francisco’s metro area are plagued with their pavements with dirty needles and strung out users nearly collapsing in the hallways of their train stations, the public is looking for a game changer like the one suggested by Mayor Farrell. The project is to be lead by the Department of Public Health, who had already begun testing the method in tent camps in 2016. Since then almost 60% of the 200 people who were given the drug are continuously working on their sobriety, according to officials. Compared to the statistic that 80% of heroin users relapse after starting treatment, this is a remarkable result. The Department of Health in estimates there are 11,000 heroin addicts in San Francisco who are syringe users, but cannot give an accurate count on how many of those users are homeless, but estimate that number to be in the thousands. 12,500 junked needles are picked up every month at homeless frequented locations and encampments. “This is a great innovation because we are going out to people where they are, not waiting for them to come to us,” said Director of Public Health Barbara Garcia. “We want to get people into treatment because of not just the heroin epidemic, but the danger of overdose. But we have this situation where people can be afraid to come in for care because of the stigma and maybe even a fear of being arrested even though we don’t arrest people in our clinics. The funds proposed by Farrell will initially come from the city’s general fund, then be reimbursed each year to the city by Medi-Cal. 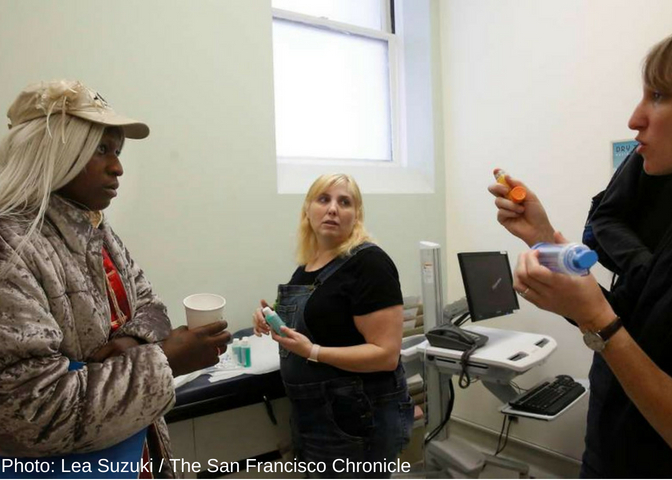 The addiction expert and head of a clinic in East Bay has described himself as “excited” at the prospect of San Francisco launching a buprenorphine team. Dr. Alex Stalcup has been prescribing it on a defined basis at his clinic since 1990, when he first heard of “this amazing new drug” in Britain. “From the very first patient, I was nearly on the edge of tears when I saw buprenorphine’s effect,” Stalcup said. “I saw people coming in throwing up, messing their pants, in terror from the junk (heroin), and 15 minutes later they were sitting up having a cup of tea. It is blindingly effective. While Methadone is also considered an effective treatment for heroin addiction, it also has its draw backs. Methadone provides a gradual reduction of cravings, opposed to Buprenorphine, which stops them almost immediately. And unlike methadone, it blocks the opioid receptors in the body making it virtually impossible to overdose or feel the effects if a user relapses and shoots up. It is prescribed to be taken regularly like methadone, but buprenorphine can be sent home in week long quantities rather than visiting a clinic daily to receive a patient’s daily dose of Methadone. Buprenorphine is relatively easy to taper off to become free of the medication, but some doctors recommend long term use depending on the patients’ history with drug abuse, in addition to other treatments and therapies to help those struggling with substance use disorder to stay clean. But perhaps the largest benefit to Buprenorphine treatment over Methadone treatment is the fact that it can be prescribed and dispensed almost immediately. Street teams along with an addiction specialist and doctor can assess a patient, write a prescription for the drug and pick it up the same day at a local pharmacy. The effects happen almost immediately after consumption, and patients can be trusted with more than a one-day supply. Homeless people are often unable to keep appointment due to lack of transportation and the means to pay their way to get places. This plan would allow the teams to drive the subjects to the pharmacy to collect their prescription and continue working with the professionals on a weekly basis. Dr. Barry Zevin said that driving the users to a pharmacy has worked very well, he leads the buprenorphine test program and as head of the public health Street Medicine division would oversee the new team. “This treatment has been remarkably effective,” Zevin said the other day as he saw patients at his downtown clinic. “In the short term and the long term, it takes away any craving for opioids, and that’s quite an amazing effect.